All of Insyde Software’s employees recognize the importance of giving back to those less fortunate. We accept that there will always be families and individuals that cannot entirely provide for themselves and that if we all play a small role in providing assistance, we can make a tremendous impact in so many lives. Here are some examples of how we get involved. 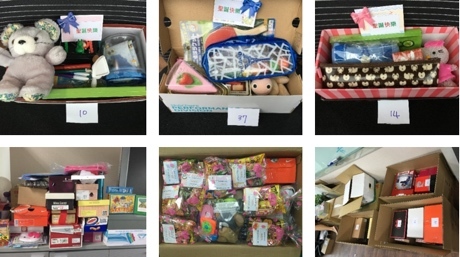 Insyde Software participated in the 2017 “Happiness Bag” charity sale activity, which supports child care services in Taiwan. With the great success of this event last year, Insyde employees were very pleased to participate again in providing Christmas gifts to Taiwan's children in need. To help give back to the community for Christmas, Insyde employees teamed together to build unique “shoebox gifts” to help bring Christmas joy to local children in need. (Above) Insyde employees put together many unique gift boxes! 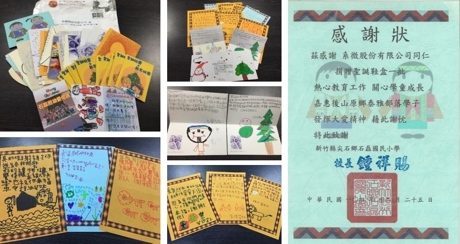 Shortly after the children received our gifts, Insyde received touching thank you cards from the children as well as recognition from Shihlei Elementary School for helping bring Christmas gifts to their students. Insyde Software joined Holiday Inn East Taipei in welcoming disadvantaged minority children from two local child welfare groups for a special Thanksgiving Day event. Over 80 preschool children from the Cathwel Service and Joy Caring Assocation Taipei gathered at the Holiday Inn East Taipei hotel to enjoy a Thanksgiving Day meal and participate in a “Fantasy Magic” show provided by Insyde Software. Insyde received recognition by the organizers for our sponsorship and participation in bringing this Thanksgiving Day event to disadvantaged minority childen. Immediately after the devastating tsunami that affected Japan in early 2011, bands of Insyde employees gathered together and committed a day's pay to the Taiwan Red Cross in support of immediate disaster relief for Japan. During the summer months of 2011, local Taiwan produce growers experienced a massive banana surplus that caused prices to plummet to a point where they could not even cover their own production costs. To help support local farmers experiencing this problem, Insyde Software purchased over 240KG of bananas from the Yongx Fruit and Vegetable Cooperatives in the Pingdong Province of Taiwan. In support of disabled Taiwanese artists seeking to support themselves through their artistic abilities, Insyde Software purchased Christmas cards from an organization of disabled artists known as "Mouth Feet Painting Artists." This organization was started by disabled artists to help other disabled individuals learn that their art can not only provide them opportunities for work, but can also improve their lives by showing them that their disability will not limit their potential in life. In support of local organizations that provide disabled individuals opportunities for work, Insyde Software invited the blind massage masters from the Taiwan Foundation for the Blind, who provided a stress-reducing massage service for Insyde employees at our corporate headquarters in Taipei. Over 228 employees have appreciated their massage services for 2011 and Insyde Software has proudly supported the services of the Taiwan Foundation for the Blind since 2008. Insyde Software again invited the blind massage masters from the Taiwan Foundation for the Blind for the Fall 2011 UEFI Plugfest in Taipei. With attendees for this Plugfest visiting from leading technology companies located around the world, we knew that this would be a great opportunity to give their service more exposure. Their stress-relieving massages were much appreciated by attendees during three full days of testing sessions and technical presentations.